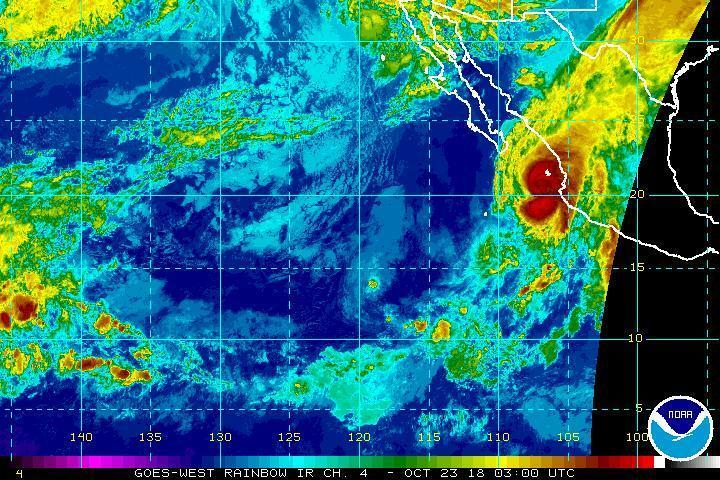 Hurricane Willa approached Mexico's west coast as a Category 4 storm on Monday night, the National Hurricane Center said. The eye of the major hurricane was 85 miles southwest of Las Islas Marias and 195 miles south-southwest of Mazatlan. It was moving north at 9 mph and had maximum sustained winds of 145 mph, the NHC said in its 9 p.m. MDT update. Willa could dump up to 18 inches of rain in some areas. Floods and landslides are expected. The storm could bring destructive waves to the coastal areas. Hurricane-force winds extend outward up to 35 miles and tropical storm-form winds are outward up to 125 miles. The government of Mexico issued a hurricane warning from San Blas northward to Mazatlan, and a tropical storm warning from Playa Perula northward to San Blas and from north of Mazatlan to Bahia Tempehuaya. The storm's track shows it making landfall Tuesday afternoon before it weakens to a tropical storm. It's expected to move east-northeast across Mexico and entering Texas as a tropical depression Thursday. Just to the south of Hurricane Willa, Tropical Storm Vicente was forecast to weaken to a tropical depression Monday night or Tuesday morning. The center of the storm was expected to make landfall on the southwestern coast of Mexico on Tuesday, the NHC said in a 10 p.m. CDT update. Vicente was about 235 miles southeast of Manzanillo, Mexico, with maximum sustained winds of 40 mph and was moving west-northwest at 12 mph, the NHC said. Tropical-storm-force winds extended outward up to 45 miles. No coastal watches or warnings were in effect. Vicente could produce 3 inches to 6 inches of rain with some areas getting 10 inches through Wednesday. Affected cities include Guerrero, Michoca, Colima and Jalisco, just to the south of the region that will take the brunt of Hurricane Willa. With Willa and Vicente, the 2018 Northeast Pacific hurricane season has hit a record for the most seasonal accumulated cyclone energy, Colorado State University meteorologist Philip Klotzbach said in a Twitter post.